Have you heard of Little Poppets? They are a new series of board books from Macmillian. 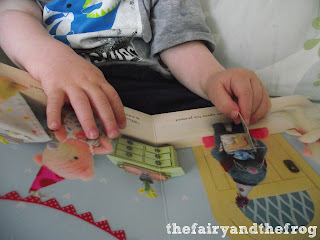 We were sent a copy of Happy Birthday Mole by Susan Mitchell and Paula Metcalf to review. 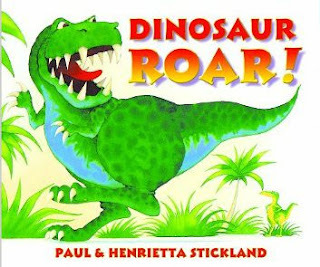 'Dinosaur Roar' by Paul and Henrietta Stickland is a firm favourite in our house. Not only is it fun to read and has engaging pictures, but the book is also great for teaching language. 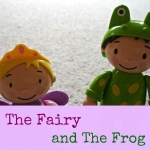 It's simple patterned language is great for children who are learning to put words together. The 'opposite' vocabulary is great for older children. 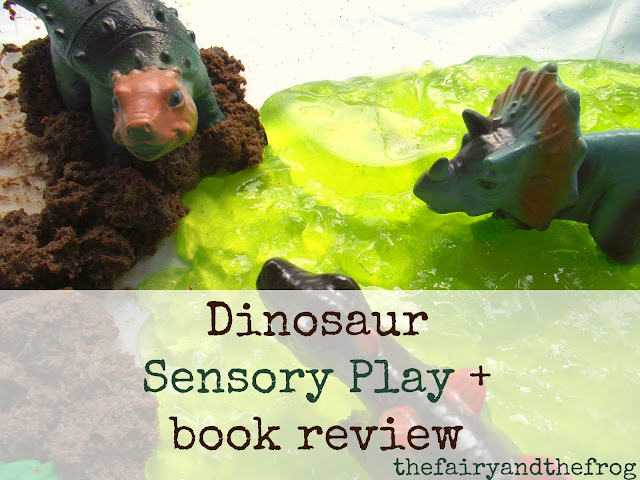 We like to have fun imagining what the dinosaurs sound like and practising roaring loudly, meekly, squeakily etc. I'd definitely recommend reading a copy if you haven't already. 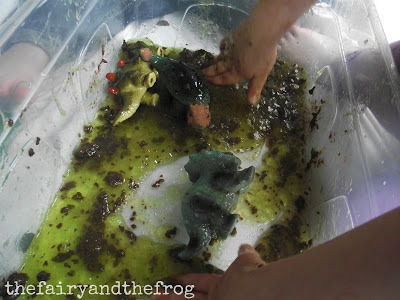 As readers of our blog may know we like to take themes from a book and develop them in play. When we found an out of date packet of chocolate pudding, I instantly thought of a messy play opportunity- a mud puddle for our toy dinosaurs. I added a jelly (jello) swamp and the scene was set. 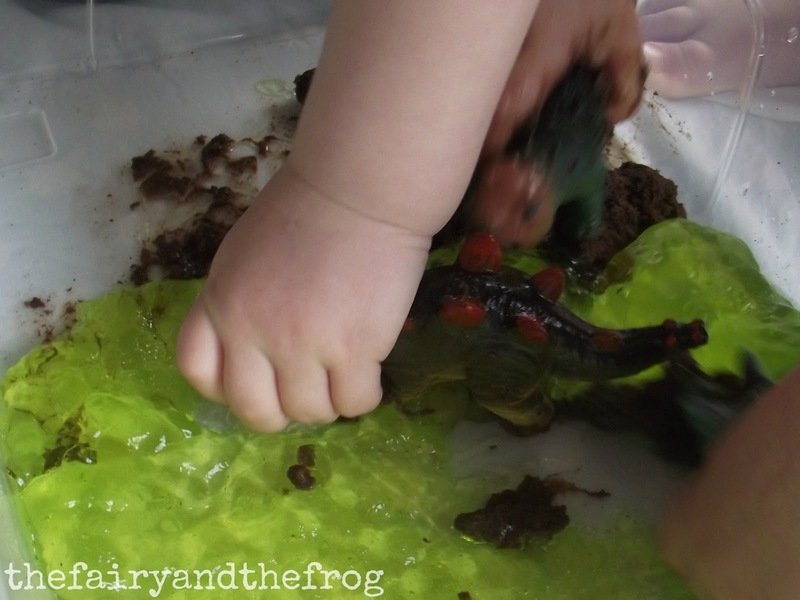 The Frog was initially reluctant to touch anything apart from his familiar dinosaurs, but he quickly copied his sister who got stuck in. We made sure we practised our roar and talking in different dinosaur voices as we played. 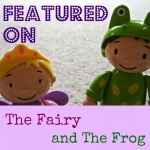 This post is part of Poppins Book Nook - a group of book inspired bloggers who write about children's books. Please link up any dinosaur children's book reviews/ activities below - we'd love to see them. How quickly time flies. Its Monday again already. That means its time for Mondays pin it parent party. 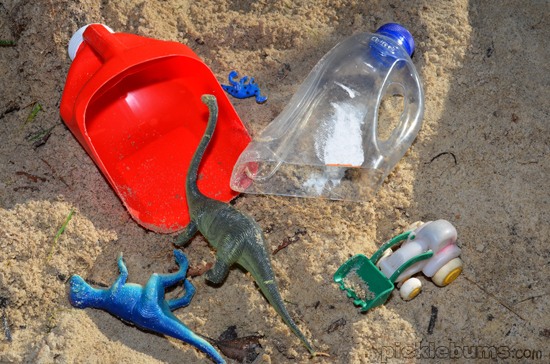 This week its Mamasaurus' turn to choose her two favourite posts. Why not hop over and see which she's chosen. (she's also got all the rules for taking part if you need a recap). All family friendly posts are welcome. The parenting pin it party is also hosted by Yellow Days, Romanian Mum, Mummy's Little Stars, Mum of One and Mamasaurus. Welcome to Mondays Parenting Pin-it Party! 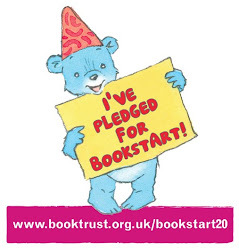 Do you want to find the lots of ideas all focused on parenting, play and family things? Do you have a blog and are looking for places to share your posts ? Love Pinterest? 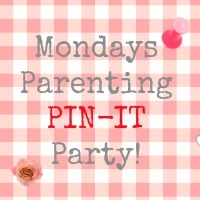 Look no further the Monday Parenting Pin -it Party is here! You can link up any posts that have a focus on parenting and families - ranging from play ideas, parenting tips, children's book reviews, kids craft and more. We will pin the ideas to our fabulous Monday Parenting Pin-it Party Pinterest Board. You can pop back next week to see which are the top two idea that we have featured. Don't forget to follow the Pinterest board, visit some of the other people who have linked up and grab a badge. Happy linking- you can add as many as you wish. Why not add an old favourite as well as a newer post. I'm looking forward to lots of new posts to read. 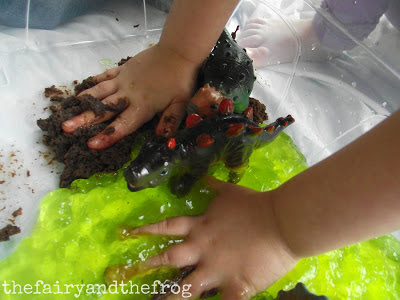 Don't forget to visit Mammasaurus next Monday to see which she enjoyed. 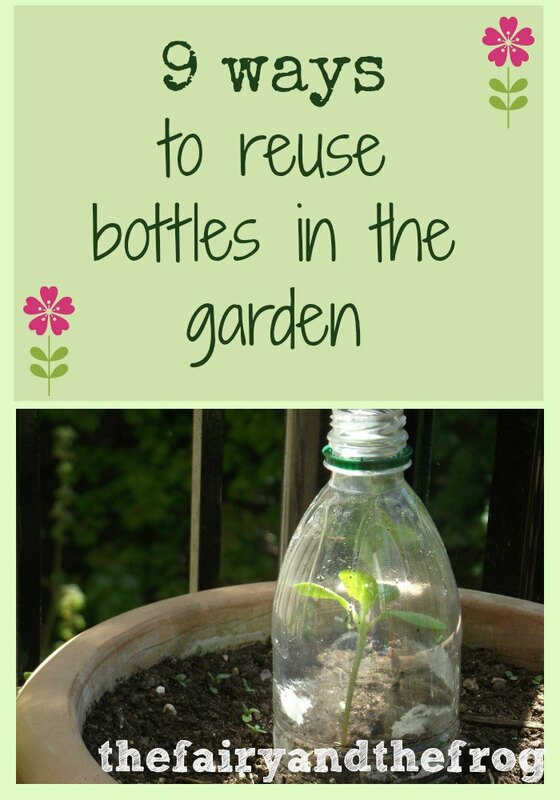 Recycling makes great sense - not only is it all about making something for nothing, it prevents waste. The Fairy is regularly reminding me to 'reduce, reuse, recycle' (a lesson she has learnt from watching Bob the builder!). Too be honest, I'm not as good at recycling/ reusing as I could be (hence the reminders). So we've been trying extra hard to recycle and reuse things this month. 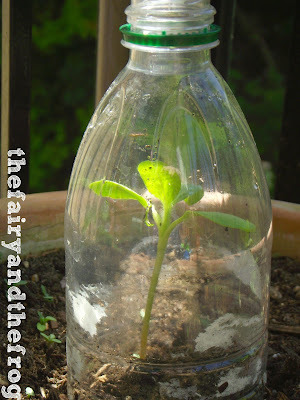 We made some mini green houses to keep our seedling sunflowers warm. I cut the bottom off - volia a tiny green house for free. Perfect for places too small for a real glass house. What we do all day has some fab vegetable pots made from old containers. I love that they have a window so you can see the plants growing. 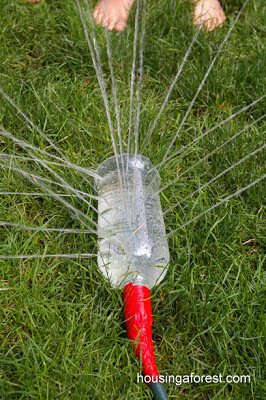 Teach beside me show how to make an elephant watering can - watering will never be boring again! Playing in the garden is such fun. How about some pretend play with these juice cartoon houses from Red Ted Art- they are super cute. Why not get active with a game of skittles from Domestic Goddesque. 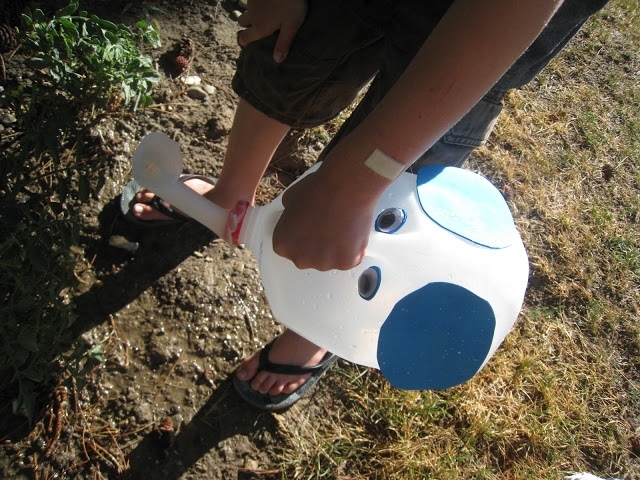 Or milk bottle tennis rackets from Laughing Kids Learn. I love this water wall from Sun Hats and Wellie Boots - it looks great fun. Or how about a sprinkler from Housing a Forest.